In an early major test of Illinois' newly divided government, the Senate passed a compromise plan Thursday to plug a $1.6 billion hole in this year's budget and avert shutdowns of state programs and services. New Republican Gov. Bruce Rauner signed the legislation into law hours after the Democratic-led Senate approved it 32-26, with all 20 Republicans voting for it. Two days earlier, the House also approved the bills with full GOP support. Following weeks of negotiation, Rauner reached the deal with Democratic legislative leaders, even though the majority of Democrats in both chambers voted against the compromise. The plan authorizes him to transfer $1.3 billion from other purposes, including parks and conservation. The rest comes from a 2.25 percent across-the-board budget cut. It also gives Rauner authority over $97 million to distribute to needy schools and discretion over an additional $90 million in case of unanticipated budget problems. The $35.7 billion budget lawmakers passed last spring that didn't allocate enough money for expenses, creating the $1.6 billion gap. Democrats passed the budget last spring hoping that after the November election they would make permanent a temporary income tax increase passed in 2011. But Rauner's gubernatorial victory scuttled that hope, and the tax increase rolled back on Jan. 1. "This is a first step, but by no means a final step," House Speaker Michael Madigan said in a statement. "There will be much more work and more decisions in the months ahead as legislators and the governor work to craft a responsible budget for the coming fiscal year. A number of Senate Democrats, who offered some of the most vocal resistance to Republican Gov. 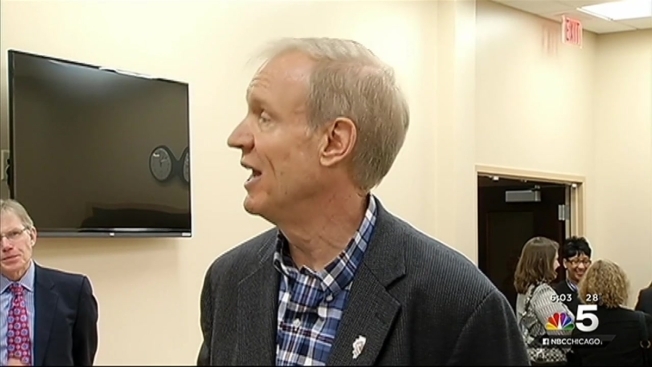 Bruce Rauner's request for authority to move money around in the state budget, said they couldn't vote for the bill in good conscience. Only 12 of the 39 caucus members voted for the measure. "I really wanted to be able to vote for this. I wanted to be able to reach across the aisle but we cut essential services," Democratic Sen. Melinda Bush of Grayslake said. "I just think there were other ways to solve this." Democratic Senate President John Cullerton gave his caucus credit for sticking to its guns during negotiations, the result being major cuts spared to schools, hospitals, and local governments. Senate Republican Leader Christine Radogno called the compromise "a significant step forward as we look to build the 2016 budget." "By choosing to make difficult decisions on a bipartisan basis, the General Assembly is helping set a new tone for what can be achieved in Springfield," the governor said in a statement.